Today we are going to take a break from The Love Dare. We will pick back up next Monday. Today I want to introduce you to my husband, Jeremy. Jeremy forgets to put his shoes up often. At any given time you can walk into my house and see three or four pairs of his shoes lying around. Jeremy forgets to turn his stinky work clothes the right way after taking them off inside out. So when I do laundry, I have to reach my hands into his not so pleasant socks and turn them around. Jeremy likes to have a Dr Pepper before bed and always leaves his cup on the nightstand for me to get in the morning. Jeremy has this one particular blanket and pillow he uses when he watches tv and he often forgets to put it up so I end up putting it away. Yep, that's my Jeremy. He rocks! Jeremy knows how much I hate having cold hands as I eat ice cream so when he fixes me a bowl, he always brings me a dish towel to hold the bowl. He knows how much I love a Pepsi from this one particular restaurant that is not close to our house, but often drives out there just to get me one. When I am feeling down, Jeremy has the family all tell "one thing we love about mommy" just to cheer me up. Jeremy declares it "tickle time" out of the blue, just to see me laugh. Jeremy knows my love of reading and what kind of books I like to read. If I am out of books, he buys me a new one. Jeremy washes my car for me every week. Jeremy always helps with dinner clean up, even when he is tired. Ladies, our husbands are far from perfect. They mess up often and will let us down often. But they also have so much good in them. Instead of complaining about their faults, we should be praising them for the good and thanking God the man He gave us. Proverbs 25:24 says, "It is better to live on the corner of the roof that with a quarrelsome wife." Are you sending your husband to the roof or are you praising him and making him desire to stay in the house? Remember that we all have faults. If you stop and really think about it, you have just as many faults as he does. Instead of looking at the bad, look at the good in your man. My husband has faults, but I will choose to look at the good qualities. How about you? I am so excited about today's giveaway! A little over a year ago I stumbled across Union 28 and immediately fell in love. Union 28 offers fabulous Christian marriage apparel but more important, they encourage strong Christian unity in marriage. I have six of their wonderful tees that tell how much much husband rocks and my husband has two telling that he loves me! About a month ago I was wearing my tee that says "My Husband Takes Good Care of Me" (my favorite tee!) 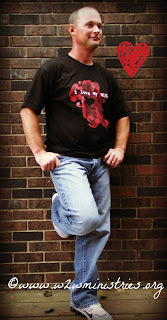 to my daughter's volleyball game, and I had three people I have never met stop me to say how much they love my tee! 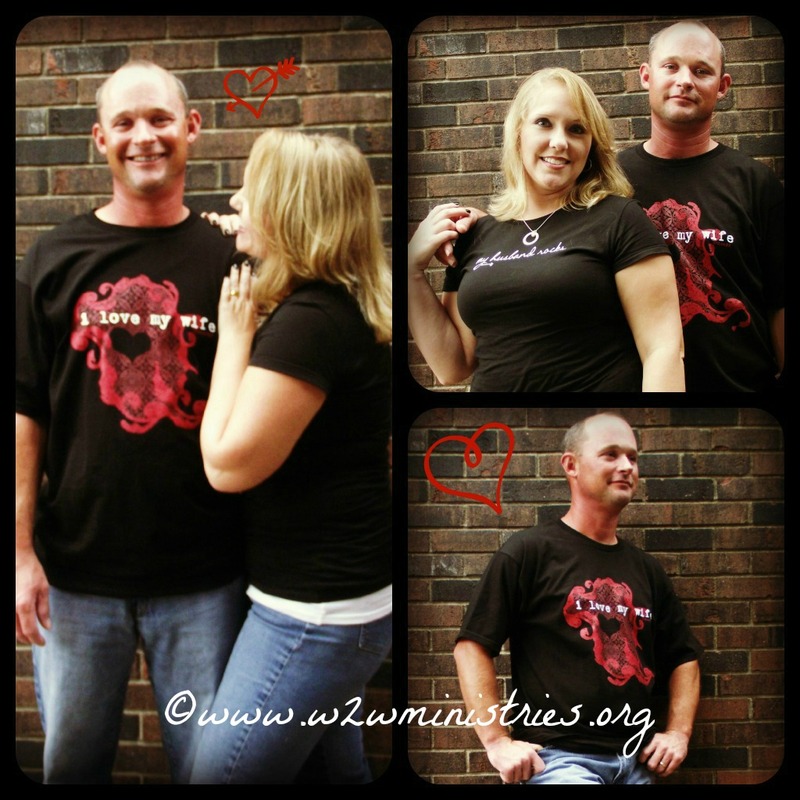 This past weekend Jeremy and I wore these tees to our church marriage retreat and everyone loved them. Union 28 apparel is awesome! More than tees, they also have hoodies, long sleeve tees, hats and more. When I buy something new, I always tell my husband about it first. However, when I buy a new Union 28 tee, I don't tell him and surprise him by walking up to him with a cute saying about how much I love him. He loves the suprise! How about surprising your husband with new matching tees that show your love for each other? In addition to the awesome giveaway we have, every single order between now and October 7th gets 15% off! Just enter the code U28WWM15 at check out. And if your order is over $60, you automatically get FREE shipping! I love Union 28 stuff, and drool over their site often, but haven't had the extra money to order anything lately....would love to win this. Thanks for the chance! Love this! Love your pix! Love your Jeremy! And I love the woman you have become. I'd like to think I had a hand it who you are, but it truly is all God! You...my dear sweet daughter...are a wonderful woman of God! I love the 'Umbrella' t-shirt and the pink 'my husband rocks' t-shirt & the gray one with the heart!! This is fabulous! Love the Union 28 website, thanks for telling us about it!!! Can't wait to shop there! I wanna win this so bad! I love the "I love my husband/wife black tees." I want to get these one day for me and Brian to wear. I like the new T-shirt with the Umbrella...my husband does take good care of me and I sure don't tell him often enough!! Okay, so you know me...I don't do blogs..lol But this one caught my eye for some reason. I haven't stopped thinking about what you and RichaLee both talked about at the retreat, and you touched on it all again in this blog. Anyway, I've never really considered myself to be a 'nagging' wife. But not too long ago during one of my devotions I came across a passage in Proverbs that compares a nagging wife to 'cancer in her husbands bones.' I started to think more about cancer... how it starts small, with just one abnormal cell that you don't even notice. Then it slowly grows and often spreads until it gets to the point where it starts to cause problems or sypmtoms. I then realized that being a nagging wife can be just as destructive to my marriage as cancer, and it is often a slow fade. I may not be the typical nagger, but realized that even the smallest of things I say or do can be causing damage to my marriage. And that just as we take precautions in our everyday life to try and avoid getting cancer, (wearing sunscreen, for instance)I need to be taking precautions in my marriage everyday to avoid becoming "cancer to my husbands bones" (such as not nagging!) After hearing a similar message at the retreat from you and RichaLee, God won't let me stop thinking about it and reminding me! Your blog was a great reminder as to what we should be doing to our husbands instead of nagging. We should be building them up and encouraging them! I love the He Loves Me A Lot DAISY V-Neck. I love the "my husband takes good care of me" tee. I had elbow surgery 2 weeks ago and he are ally has been taking good care of me. I love the My Husband Rocks Original T in Pink!